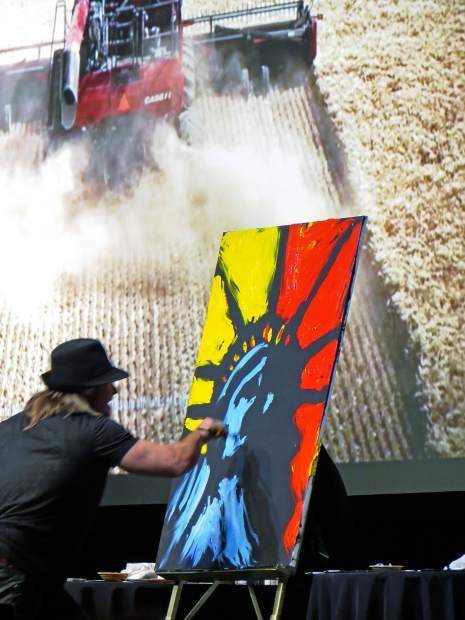 Erik Wahl, internationally known speed painter, motivates the beef industry to think more creatively. Whether you are the leader or key decision maker at your farm or ranch or serve in a leadership role in an agri-business company, do you find yourself following the same routine every day because it is what you know best? No doubt, doing so brings security, because you know what you will be doing, when you will do the task and often, what the outcome will be. But, has this resulted in a safe and status quo routine. Are you uneasy with developing new or innovative principles or charting a new course of vision? My guess is, most of us are, because the unknown is uncomfortable. However, Erik Wahl, keynote speaker at the 2015 Cattle Industry Convention and Trade Show, Feb. 4-7, in San Antonio, Texas, captivated an audience of 7,000 cattle producers and industry enthusiast’s when he challenged status quo thinking and performance. In a room full of cowboy hats, wranglers and western attire the audience soon realized — Wahl — a spunky, internationally-recognized graffiti artist, dressed in all black, with his hands covered in paint, was about to present an unconventional message. This uniquely talented artist, had the audience in complete silence as he painted a canvas, at what seemed like almost lighting speed, with a video playing in the background of agricultural scenes. In less than three minutes, he created an amazing painting of the ‘Statue of Liberty’ while sharing part of his motivational message. A previous corporate employee, Wahl, lost his job during the dot.com crisis. He studied business in college and like many people, thought with a degree in hand and strong work ethic the next thing was that perfect career. But jobless at 30 years old with a family, he came to realize, he had to determine what inspired him, if he was going to find that next career. “Determining what inspires you is not easy,” he said. Wahl explained, society molds us to focus on careers, doing our work and follow the path of rules, we are taught in school and from those around us. “Ninety percent of our time we are (left-brained), focused on structure; and ten percent of our time we are (right-brained), creative.” We have come to reserve creativity for those like poets, painters and writers. “We are capable of more than we have been told.” Wahl, will never forget his elementary art teacher telling him he had no creative artist skill — he didn’t color inside the lines! Now as an internationally renowned artist who has sold paintings for $20,000, he shares the message of innovation in business through creativity and improving performance to many of the nation’s top corporations. In his presentation, he challenged the beef industry to uncover their creativity in their business and performance. With adults, risks can lead to fear and can paralyze our creative ability. 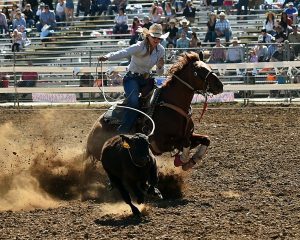 “So, how are you going to ignite your artistry as a cattle rancher?” Are you going to let fear and risk hold you back or are you going to be progressive with the issues facing your ranch, or your industry such as consumer trust and loyalty and telling your story, he pointed out. “Overall, Success comes from unleashing your creativity and imagination,” he concluded.